From the award-winning author of Quicksand, a gripping legal thriller that follows one woman's conflicted efforts to overturn what may be a wrongful conviction. I'm giving you a chance to achieve every lawyer's dream, said Sophia Weber's old professor. Freeing an innocent man. When Sophia Weber discovers critical flaws in the murder investigation, she decides to help Ahlin. But Sophia's doing her utmost to get her client exonerated arouses many people's disgust. And the more she learns, the more difficult her job becomes. What kind of man is her client really? What has he done? And will she ever know the truth? Malin Persson Giolito was born in Stockholm in 1969 and grew up in Djursholm, Sweden. She holds a degree in law from Uppsala University and has worked as a lawyer for the biggest law firm in the Nordic region and as an official for the European Commission in Brussels, Belgium. Now a full-time writer, she is the author of four novels including Quicksand, named Best Swedish Crime Novel of the Year and now a Netflix original series. Persson Giolito lives with her husband and three daughters in Brussels. Rachel Willson-Broyles holds a bachelor’s degree in Scandinavian Studies from Gustavus Adolphus College in St. Peter, Minnesota. She started translating while a graduate student at the University of Wisconsin-Madison, where she received a PhD in Scandinavian Studies in 2013. 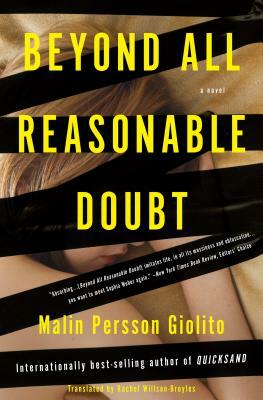 Her translation of Malin Persson Giolito’s Quicksand was published in 2017. Willson-Broyles lives in St. Paul, Minnesota.